A soggy, broad valley in the Highlands. 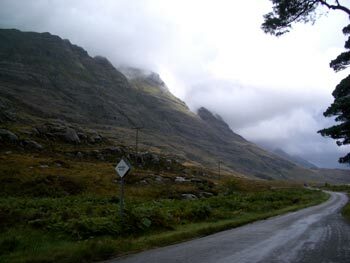 We agreed with the Scot's: their roadside scenery was more interesting than that of their English neighbors. The Highlands a little north and west of Inverness were the more rugged beauty we enjoy, though the flatter English terrain had been just what Bill's injured knee needed (and the English do have more historical sites.) The Scottish land wasn't rolling hills but unexpectedly egg-crate-like clusters of massive, steep-sided hills. Hills that might only be 500' or 1000' high but were imposing because their bases were often only a half mile away or sometimes even under our roadbed. The vegetation on the narrow valley floors was a mix of bunchy tall grasses, Scotch Broom going to seed, bracken ferns, birch trees and pines. The hills ahead of us might be covered half way up with densely packed conifer plantations that abruptly gave way to an unidentified mat of low growth--like the mix of heathers and ferns we saw south of Edinburgh. Some hills revealed protruding craggy rock faces, while others were completely covered with vegetation. 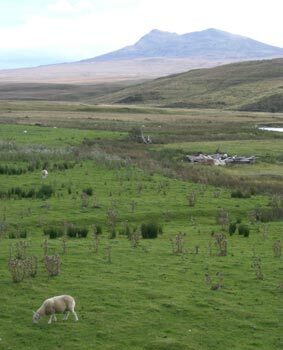 The steep-sided hills occasionally looked like they had been forcibly shoved away from each other and the resulting valley had filled in to form broad, green pastures dotted with endlessly munching sheep. The Scottish Highlands were a study in browns and deep conifer greens. And the Highlands' landscape architect created an amazing amount of visual variety on a limited design budget. There wasn't a lot to work with: some big rocks, a few conifers, and a lot of heathers, ferns and grasses. Close-up the heathers were colorful, as just the blooms on one plant had delicate pink buds, fuchsia-colored blossoms, pale pink older blooms and salmon-colored faded flowers. The tiny dark green leathery leaves revealed the underlying stems that ranged from a purple tone to brown. In the distance, the blended shades of the heathers became almost a toasted brown, with much of the purple washing out. The dark green bracken ferns were all rimmed with dried, brown fronds. In the distance, both the heathers and the ferns created a thicket of growth with a tufted looking surface and a decidedly brown tone. A rainy day view of one side of a glacier carved valley. In some areas hardy, 2-3' chive-like stems grew in massive clumps. By mid-September, the tenacious spherical blossoms on the stem tips had turned brown. Many of the low and tall growing grasses also had brown or reddish tips, either from seed clusters or from the dying back of the tips. And even tall marsh plants that could easily be called "sword grass" for their thick, leathery blades were fringed with brown. The Scottish landscape designers experimented with all the possible combinations of the scant resources: heathers mixed with ferns, heathers mingled with grasses, grasses intertwined with ferns and of course, masses of just heathers, ferns or grasses. Densely packed conifers in forest plantations dominated some slopes while a few protected areas were being returned to an airier mix of the native mix of birches, alders and Scottish pines. Like the varying thickets of vegetation, the rocky formations took an assortment of forms on the Scottish landscape. The glaciers had left their marks all over the valleys. On the macro-scale, the glacial carved valleys had the characteristic steep sides and scarred rock faces. Some of the low-level boulders still showed the polishing and scratching caused by the creeping glaciers 10,000 years ago. "Hummocky moraines," which can be giant warehouse-sized piles of sand, grit, and rocks left by receding glaciers all but filled in the bottoms of some valleys. (The relentless rainstorms prevented getting any photos of these.) And most any panorama had its share of rocky outcroppings or patiently standing boulders. A meandering stream below a conifer plantation.. The patterns made by the surface water also took a creative range of forms. In some broad valleys the meandering streams formed neatly edged oxbows through the grassy marshes. In narrower and steeper confines, the streams gathered force and crashed down over a tumble of boulders. And at the peak of the rains, dozens of opportunistic waterfalls channeled the excess water off the coarse surfaces of the glacier-carved slopes. I was stunned when I wandered off the road to snap a photo and discovered deep puddles formed even on well-sloped land--the soggy ground and puddles sometimes being camouflaged by the bristly undergrowth and buoyant moss. We assume it was the underlying peat that retained the water that other soils would have allowed to drain. And it was the peat that prompted periodic clusters of long-handled tools topped with square bladed shovels, rubbery flaps or wire mesh hoops next to the "No Campfires" signs. 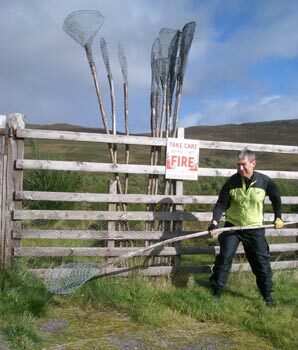 We were told these 'beaters' were for extinguishing surface flames of wildfires before the peat could ignite. A peat fire in the dry season (if there ever is one) must be a nightmare to extinguish but all the roadside peat we saw was a sloppy black muck. Bill testing out a wildfire beater. The generally Spartan look of the landscape shifted as we approached isolated villages. One particularly lush sea level community had 30' high rhododendron hedges growing along side the road. And occasionally we'd see smaller, leaner looking rhodies scattered among other village plants. And we finally learned the name of the red-berried tree that we'd seen all over Europe, which is rowan or mountain ash. In Scotland we were seeing both neatly shaped urban rowans and the wild specimens with a shrub-like branching structure. Rowan is used as a decorative tree in the States too but surprisingly isn't in the same family as the ash used for lumber. The tranquility of all this remote and rugged, glacial-carved Highland terrain was interrupted almost everyday with a fly-over by RAF fighter jets. They flew deafening low in the valleys--seemingly below the tops of the hills around us. One would streak by, giving us a fright while jolting us back into the modern reality of heavy machinery. We then braced for the second jet, as like the Kangal-like dogs in Turkey, these menacing creatures always seemed to travel in pairs. The RAF jets were about the only 'wildlife' we saw. The rabbits we'd seen farther south had disappeared and even birds were rare daily sightings. We weren't ever long out of the sight of sheep however, which were always unattended. The sheep could show up just about anywhere: on either side of the fence along a road, next to the road, on the road or on the rare railroad tracks. We finally discovered that a loud "Yee-haa" would scatter the skittish ones before we converged, preventing them from running into us or down the road in front of us. And the good news about the wet weather we endured was that it prevented an encounter with some of Scotland's notorious wildlife: the dreaded biting midges. The look of the land and the vegetation didn't change much when we road across the bridge at Kyle onto the Isle of Skye, though we increasingly felt like we were in the boonies as we made our way farther west. The markers on the road for a few homesteads off in the hills were often a small red mail box on a post and a nearby phone that may or may not be working. The book-mobile driver waved to us as she headed off to provide library services to the remote areas and we were told about a novel equivalent, the bank-mobile. We didn't spot them, but were told that 2 different banks offered home delivery of financial services. A staff person from the bank actually makes house calls and also lingers out in front of some of the few post offices in the region on a regular basis to help the isolated population with their banking needs. "Riding the Storm," not "Riding Out the Storm"
Scotland, like western Oregon, gets it's green look from the rain dripping out of the moisture-laden ocean air. And the exceedingly changeable weather varies more quickly and more wildly than Oregon's. We went into an Inverness grocery store with mixed sun and clouds overhead, saw a torrential downpour through the windows while shopping, and by the time we exited the store, the parking lot puddles were the only clue to the brief but extreme turns in the weather. That evening, we carefully watched the TV forecasts for our first few days in western Scotland and were stunned to see that we were scheduled for fierce winds coming straight out of the north in the morning but by afternoon on the same day the winds would be coming straight out of the south. And the water levels of the rivers were apparently just as changeable: on the day we rode out of Inverness we noticed the nearby river was likely several feet above it's usual level but our B&B hostess that evening reassured us that a single overnight rainfall was all it took to bring the river level up but that it would go down almost as quickly. 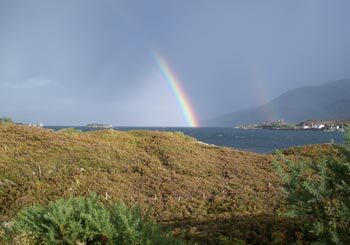 On our first day out of Inverness on the eastern coast, we were showered on a half dozen times. I felt like laundry being misted for ironing as it rained enough to make us damp but not enough to soak us. Only one rain event made us pause behind the wind sheltering of trees with a local man, whereas for all the other outbursts we just kept riding or eating our lunch. Not putting on rain gear was barely tolerable in the mid-50's degree weather with intermittent sunshine. We had layered on enough clothing that the wind dried us out before we chilled from the periodic dampness. But the temperature drop that came with each passing gray cloud served as ample warning to layer on a little more clothing the next day and to keep the rain gear handy. Winds in the 50-70 mph range were predicted daily for our area and the gusts on our second day out of Inverness were definitely in that range. The strong gusts tore off my shower cap helmet cover and Bill finally pocketed his to prevent losing it. We periodically stopped suddenly to avoid being blown off the road into the nearby river or a passing car. I planted my feet and leaned into the wind while bearing down on both brake levers to keep the bike from skidding along in the wind. The gusts usually eased after 1 to 2 minutes and we cautiously moved a little farther down the road while keeping our speed low to allow a quick stop with the next impetuous gust. We ended the day soggy and frayed from the heavy downpours and fierce winds and carefully dried out clothes on the ration of heat in our room that night. The tricky winds late on our second day turned out to be just the beginning of a series of harrowing experiences--a journey for which I predicted 9 out of 10 days of rain as we traveled from Inverness in the east to Fort William in the west via the Isle of Skye. Day 3 into Lockcarron was one of those days that will be on the short list of "Remember the day that ...." because of wind and rain. It felt like paybacks for renting a car and not pedaling in Iceland, as the wind never stopped. Like Day 2, we sometimes suddenly stopped to save ourselves from being blown off the road from a sudden gust. It was headwinds and crosswinds for all but a couple of luxurious moments in a tailwind. At one point it was blowing so hard that the fastest I could go downhill, forcefully pedaling, was 4 miles an hour--a bit more than walking speed. Our average speed (according to the bike's impartial computer) for much of the day was under 6 miles an hour. On flat ground with no wind we can go 6 miles an hour with just a pedal stroke every now and then. The rain started and stopped dozens of times on the first few days. Sometimes it was just a spitting shower that lasted a couple of minutes, other times it poured for an hour. But unlike the rains of our Pacific Northwest that settle in overhead for days on end, these rains stopped frequently. The breaks were measured in seconds or minutes, with a 10 minute interruption being rare. But they were welcome moments and we learned to stop immediately to air the condensing perspiration out of our rain gear or to make an equipment adjustment. If we hesitated, we risked missing the brief respite from the rain. The winds never stopped, so ventilating our clothes didn't take long. We'd often look ahead when enjoying a brief dry spell and see a curtain of mist hundred's of feet high snaking along in a diagonal line in front of us. To look at it, we were never sure if it was bona fide rain or just moisture-loaded thin clouds, with interesting, denser-looking columnar folds along the length of the curtain. But invariably, before we finished the debate, we had our answer: it was rain and we were in it instantly, even though the bulk of the moisture looked minutes away. Like Iceland, most of the Scottish Highlands were devoid of natural or constructed shelter so we took the full force of the wind almost all of each day. When exhausted from battling the wind and the rain we'd make a little U turn onto to the grassy roadside edge where available, turn our backs directly into the wind and called that a break. At least the wind driven rain was off our faces for a few minutes and we could relax our shoulder muscles that did the brunt of the work to keep us tracking on the pavement. Even in the downpours, we'd sometimes unzip while resting with our backs to the wind to vent a bit of perspiration from our rain jackets. Two of the many rainy-day rainbows. We saw a lot of rainbows these first few storm days, though we would gladly have foregone the pleasure for better weather. Bill noticed one motorist who paused to photo us in our red jackets as we were framed by a distant rainbow. Too bad we couldn't get a copy of his picture instead of ours on the bridge at Kyle. Amazingly, days 4, 5, and 6 were each worse than the previous day and the rainbows vanished in the increasingly intense downpours. The wind and rain were blamed on the spent hurricanes flinging themselves northeast across the Atlantic after battering the US coastline, but the winds lasted for more than a week instead of being measured in hours like when the hurricanes touch land elsewhere. 50-70 mph gusts were always in the forecast. Our little mechanical wind gauge only goes to 45 mph, but often when I sampled the winds its little indicator needle was immediately slammed up against its limit. The first few days the background winds held in about the 10 mph range, but then they moved to more consistently being in the 20 mph area. Even though our gauge was useless in documenting the higher winds, I have no doubt that we were getting them. Dozens of times each day we'd quickly plant both feet on the ground when the strongest winds rolled through. Too many times we struggled to dismount and gain control of the bikes fast enough to avoid being dragged across or off the road. Several times Bill stood along side me to partially block the wind while I wrestled to stabilize myself and my bike. In the windiest intervals, we dismounted and hunkered down over the handlebars with every passing vehicle as we had no confidence that we could control our course at the crucial moment of sharing the same width of roadbed. Sometimes a couple of minutes stop would do it, other times it took much longer for the stiffest gusts to pass or for us to regain our strength to press on. We were extremely lucky to happen across a rare and well positioned bus shelter during the worst interval of the worst day. I had nearly laid the bike down on the the ground as I was leaning into the wind to stabilize myself. I was barely able to hold a suddenly taken position that an oncoming bus had made more urgent. We clawed our way into the gale-force headwind to the shelter with our bikes. This much needed mid-afternoon refuge gave us a chance to ponder how we would make the last 10 miles of the ride in the increasingly ferocious winds. Darkness was coming early because of the murk and we couldn't stay long, but we must have lingered 20 minutes. I put on heavier socks and gloves as we nibbled on a snack and recovered from the physical and psychological stress of the battering. Two soggy hikers joined us and they wrung out their saturated gloves and poured trapped water out of their rucksack covers as they too procrastinated and snacked in the welcome shelter. We were stunned upon discovering diminished winds when we finally stepped out of our plastic shelter in our resealed rain gear: it didn't look any better judging by the steep angle of the rain but we could again control our bikes. And this miserable day had an unimagined happy ending as the last 7 miles were on a gentle downhill with a strong tailwind. 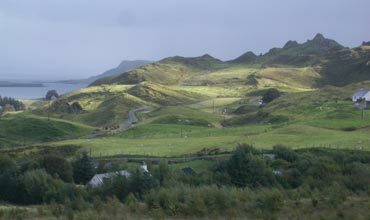 The tail winds were quite manageable that late afternoon as we rode into Portree on the Isle of Skye, but on other days the tailwinds were as treacherous as riding a bronco. Sometimes we'd decline the gifts of the skittish winds that pushed us along over 20 mph because we couldn't control our bikes. We'd instead clamp down on the brakes to keep the swirling tail to cross winds from hurling us into a wild trajectory. I don't know which was harder, controlling the bike in headwinds or tailwinds, but the tailwinds at least offered moments of fun. The headwinds were absolutely sapping our energy. The up and down Highland terrain approximated riding in the Alps, as our weekly elevation gain of 14,600' approached our learned-in-the-Alps-limit of 15,000.' The bulk of the winds were head and cross winds and they seemed to double the energy required to top the many hills. 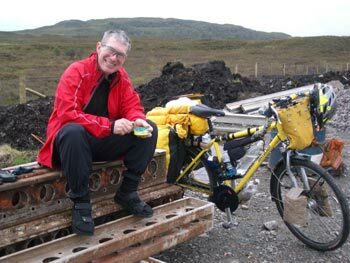 Bill had broken down the 10 day route from Inverness to Fort William into mostly 30-35 mile days, thinking that they would be moderate enough to allow recovery time for his knee. But unfortunately his additional recovery time was abruptly curtailed. The many steep grades, the steadily accumulating gain and the punishing winds didn't qualify as rehab. Luckily, his knee was doing better than he realized and he only pushed the bike up 14% and greater grades. Even with his uncomplaining knee, it was all we could do to complete those miles each day because of the draining effect of the brutal weather. The winds were accompanied by increasingly heavy downpours of rain with 4" in 2-3 days being reported somewhere in the area. The first few days of the route brought frequent though brief breaks in the rain but the 3 worst days had no such reprieves. Gone were the 'airing out' breaks and gone were the chances to get glimpses of the distant scenery. We had to suddenly up our caloric intake and no longer had time for reading or writing in the evenings. We cut back on the amount of laundry we did each night and spent our time and the available heat drying out our clothing, both from the rain and the trapped perspiration. Much of our remaining energy was devoted to rotating gloves, socks, jackets and pants on and off the heaters--it was about all our exhausted brains were good for. We never knew at what time the heat would be shut off and getting everything dried out for the next day's ride was second only to eating. Isle of Skye: a brief sliver of sun on the hills at the northern tip . It was our neck and shoulder muscles that complained at night, rather than our legs. Our legs worked hard to power us against the headwinds, but they are amazingly resilient to our requests for more output. It was the upper body muscles that suffered from the sudden challenges. When you look at Tour de France racers like Lance Armstrong, you notice that they have skinny, underdeveloped arms, especially their upper arms. The arms take a back seat in cycling, as even much of the steering comes from shifting your hips on the saddle or even a tilting your head. Almost all arm strength is used only to assist the back muscles in supporting the weight of the upper body on the handle bars. But in wind, everything changes. All of a sudden those wimpy, clueless arms have to counter the force of the wind against the bike, bags, and rider that pushes the lot were it wants it all to go. The torso muscles work hard to give the straining arm and shoulder muscles something to lever against when correcting the path of the runaway front wheel. The legs have one job to do, and that's go 'round and 'round, preferably 80-90 times a minute every minute. In the beginning they resist, but eventually they come to accept that as their job and that's what they do endlessly. Some days are easier, others are harder, but they still go 'round and 'round, wind or no wind. And the legs have those 27 gears to modulate the challenges of the terrain for them. The upper body fighting the winds has no such familiar routine to settle into, nor do they have any mechanical intervention like the gears to aid them. Every gust comes at a little different angle, with a little different pattern of pulsing and with a different final speed and duration. The arms continuously have to react and perfectly match the challenge of the wind--not too much or too little force--to keep the bike tracking on the road. The legs can fluff it by skipping a rotation here and there with little consequence, but such a lapse on the part of the arms in a stiff wind could be disastrous. And of course, the other challenge for the arms is that they get no conditioning or training for these extreme conditions, which usually only arise for part of an hour each year. So when the winds whip up, the unprepared arms have to rally and are quite willing to complain about their sudden overuse. Amazingly, we did manage to keep our good humor during this ordeal. Having relatively low mileage days was the key, combined with a lot of experience in knowing what we need to keep ourselves going. While on the road each day we were very careful not to get calorie short. We'd push on a little way in hopes of finding some form of shelter from the wind and rain for lunch but when none appeared, we stood at our bikes and shielded our food from the rain with my mini-sized sun umbrella. And though we got through the ordeals of each day on will and determination, we also stopped as often as we needed to rest or to collect ourselves. Most of the stops were taken just bracing against the lashing rain and wind, but even those pauses helped us keep our wits about us. We also benefited from the temperature staying above 50˚. If it had dropped lower, getting chilled at lunch and during the other stops would have been a severe problem and we would likely have been crankier because of it. A welcome 'bench' for lunch during improving weather. All of our carefully selected gear also paid off in these brutal conditions. There is no substitute for having good raingear and each year we are willing to pay a bit more to have it. Our homemade waterproof overmitts were a huge help in keeping us comfortable and the new this year, for-Gore-Tex heavy socks were a boon to our feet in our Gore-Tex over socks. Tape moved up the list of important things to have on hand in the winds. I finally resorted to extending the sides of my wrap-around sport glasses with a width of electrical tape after too many hours of rain pelting my eyeballs during the crosswinds. When I could spare a hand, I had ridden with a hand over the side of my head to shield my windward eye. When that wasn't possible, I would just close the eye on that side to give it a rest from the abuse. And after having 3 or 4 shower cap helmet covers stripped off by strong gusts, Bill was about to tape the next cover onto his helmet but slightly lighter winds were in the forecast. We thought the gales from the dwindling hurricanes were behind us when we left Fort William, but 2 days later hurricane Ivan was to taunt us. The hostel host showed us a printout of the forecast which included "torrential rains" and up to 100 mph winds at the 3,000' level. We'd only be at about 1,200' but braced for another difficult day of gale force winds. The climbing group at the hostel decided to drive to a city and spend the day shopping for outdoor gear rather than hike as planned. Our food stash dictated that we move on rather than lay over another day in this remote area, so we headed out knowing at least that the winds would be tail and crosswinds. Contrary to the climbers experienced opinions about the weather system, Ivan unexpectedly veered north. The moderate rains dwindled after lunch, then the clouds parted and the temperature shot up about 15˚ over 2 hours. We were dumbfounded at needing to stop repeatedly and peel back the heavy layers we'd been wearing for weeks. We still struggled against gusts that ran off our wind gauge's scale at 45 mph but at least we weren't also being pelted by accelerated rain drops. And we hoped that for our sake and that of the Floridians that this was the last of the hurricanes. This encore of gale force winds made it perfectly clear that we were exhausted to our core. Our Iceland car trip and Bill's knee injury had left us under-trained for such demands and our overworked bodies needed some serious recovery time. The marginal weather, the limited sightseeing opportunities and the so-so lodging options didn't invite laying over a few days, so Map Man dropped our riding days back even further, to the 20-25 mile range. That relative rest was still surprisingly taxing and we realized that it would take the better part of a week for us to regain our resilience after the steep grades and gains made more difficult by the tortuous winds. Our best look at the mountains on Skye. One of the causalities of all this wretched weather was our truncated look at Scotland. The distinctively shaped ancient mountains that many people raved about were mere silhouettes even at mid day. 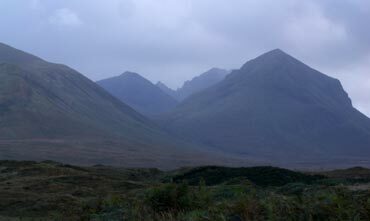 One Scottish B&B hostess commented that it was only on her 6th visit to the Isle of Skye that she had anything but dreadful weather and was finally able to see the beauty of the mountains. The highest peak in Britain is Ben Nevis at 4,400' near Fort William and even at its low elevation people sit around like at a base camp at Mt Everest to make an ascent on a day that is worth the trouble. Many Scots commented on what a lovely summer they had last year. But as they carried on we couldn't help but realize that it took a heat wave so potent that it killed thousands of people on the Continent to bring enough warmth for Scotland to have a pleasant summer. It seemed like going to the coast and islands of Scotland was like Oregonians going to the beach: we go hoping to catch the rare warm, sunny day and then reminisce for years about our good fortune when it happens. The highly variable and potentially fierce weather makes visiting Scotland, especially western Scotland, challenging. 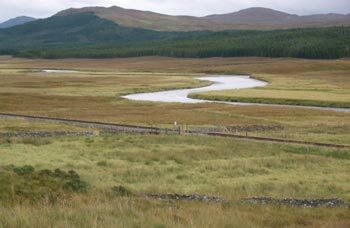 But during the brief clearing spells when more details of the landscape were visible, we could imagine the Scottish Highlands to be a rewarding biking trip. The over 100 short grades in the teens over the course of 2 weeks made for taxing riding but the ever-changing views from the twists and turns in the roads created a lot of visual interest. But the visitor pays a high price in terms of unpredictable weather, and the accommodations prices were about the same in Scotland as England: $90 a night was the going rate for a B&B for two and a night at a hostel without breakfast ran around $40. Food in Britain is as much as 50-100% higher than on the Continent and the prices go up that much again on some items when you are shopping anywhere but the biggest supermarkets in the cities. For all those reasons, we won't be coming back to Scotland anytime soon. At Kyle near the Isle of Skye, Bill unintentionally provided the answer to a lingering question of mine: "Is it possible to be grazed by one of those too-close cars and not dump over?" The answer is "Yes." We had just come out of the quiet hills of the Scottish Highlands onto a busy main road and were trudging up one of the last hills on a long day. I was 50' ahead and heard the familiar barbarian roar of simultaneous anger and fear that comes out as a low, growling "Argggh." I knew a car had come too close to Bill and he was both therapeutically giving voice to his intense feelings and informing the motorist that he or she had misjudged the distances. Unlike all previous times when one of us had let an "Argggh" fly, this offending car stopped a bit ahead of Bill. I could see that Bill had stopped his bike but was still straddled over it, so didn't think too much of it. After a long huddle with the driver and the passengers, they got back in their car and drove off and Bill pedaled up to where I had stopped out of traffic. Remarkably, the car had nicked him on the back of his hand while he gripped the handlebar, presumably with the car's side view mirror. The northern European tourists were probably struggling with an unfamiliar car and the awkwardness of driving on the left side of the road and misjudged the distances. Bill commented that at the time he didn't even know he had been dinged. He heard a thump and suspected that the car's passengers heard it too, prompting them to stop when it was punctuated with his roar. When they saw the rapidly forming bruise on the back of his hand, they offered to take him to the hospital, which he declined. He presumed that it was a break-away styled side view mirror that swung in towards the car as it clipped him, minimizing the jarring he received. Fortunately the ding didn't cause him much discomfort and didn't dump him over, which would have had much more serious consequences. Understandably though, it made him a bit edgy for the remaining half hour riding for the day and would cause him to wince in traffic a bit more than usual for the next week. Bill's "thump" likely was delivered by a tourist from the Continent, but we heard of and observed a number of instances of inexcusable driving behavior in rural Scotland. We weren't of course able to confirm that the bullheaded drivers were Scottish, but by watching for the country identifiers on license plates over the years we have concluded that foreign tourists tend to be very deferential drivers. In some countries, they are consistently the most courteous with us as cyclists and so we assume the offenders here were the Scottish drivers. An English couple in the Scottish Highlands said that before the main road in front of their B&B was widened, that several times a week oncoming trucks would get locked together attempting to drive past each other on the one lane road. Apparently the entangling began with the side view mirrors and became severe enough that a tow-truck was called to separate them. It was incomprehensible to me that the truck drivers would be so foolish as to get trapped and yet hours later we saw a smaller version of the scenario play out before us. We were on a narrow, one lane road with very frequent pull-outs to allow for passing. In front of us, 2 cars approached each other in a very narrow section, neither volunteering to stop as is the obvious convention. They charged ahead, horns blaring, until they were wedged against each other and were forced to stop. They did eventually resolve their predicament without a tow, though I don't know if they escaped damage to their cars or a harsh exchange of words. A more astonishing situation occurred a mile or 2 out of our destination town of Lochcarron when a small RV inadvertently locked horns with a small blue car with local plates. It was on one of the narrow, one lane roads with intermittent passing-pullouts that we had ridden all day. The blue car driver had decided the RV should back-up to a passing place instead of doing so himself. The RV was driven by an older French man who was clearly disadvantaged by being in a larger vehicle with poor rear visibility on unfamiliar roads with their steering wheel on the 'wrong side' of the vehicle. Unlike the car, the RV was also boxed in by a low stone wall on a cliff which was on a curve. The RV had a little room to back-up but also quickly accumulated 8 more vehicles behind it. The blue car had nothing but a straight open road behind him and could have easily backed in to an unusually wide cattle crossing but amazingly, the blue car driver wouldn't budge. Bill was trapped in the stalemate behind the RV. I was 100' ahead of him well behind the blue car with a great view of the ridiculous situation. I signaled the 2 cars approaching the blue car to slow hoping the blue car would back up. They paused for a moment, then decided to add numbers to the blue car's side. They scooted down and stopped bumper to bumper behind the blue car. The French driver finally managed to back-up enough to allow the 3 little cars to pass by the line of 9 stopped vehicles which included 2 RV's and a large Land Rover. Whatever the nationality of the blue car driver, I was absolutely stunned at the piggish attitude. Rarely have I seen such inconsideration and pushiness on countryside roads. Iceland was crawling with tourists in rental cars on narrow, difficult roads (and 1 lane tunnels) and all of the drivers, local and foreign, handled with situation with calm consideration. We only spotted a few foreign license plates a day in Scotland, but about a quarter of the drivers were bullish in their approach to us. Some waited patiently for us at pull-outs or drove slowly until we reached one, but others insisted on buzzing by us too closely, even when we were clearly wobbling with the pulsing of the strong winds. It was a noticeable difference from England where we felt the drivers were quite careful with us. I was especially grateful for their consideration when we were forced to ride on dual carriageways (4 lane highways) in England during Bill's initial rest for his knee. We were in hair-raising double and triple-lane traffic circles and highway shoulders and were shown the utmost regard by the motorists. I was dumbfounded each time in rural Scotland when an oncoming driver refused to shift their position on the road so that the car behind us could pass by rather than be forced to trail behind. It would have been so simple to share the road and yet obstinacy seemed to prevail over common sense. And too many drivers seemed to be blasting around on the small country roads without much anticipation for the unexpected on the blind curves and passing without a plan for the unusual--like us. There seemed to be too large of a percent of the driving population that was relying on the good will and good manners of the other drivers. One day I commented to Bill that there were a number of drivers giving us a friendly wave as we passed by. Some I am sure were acknowledging our courtesy in pulling off the narrow road, but some were offered at other times too. Bill's response added a laugh to a day made grim by the weather: "They think we are crazy for being out here and want to stay on our good side." We never assume we are getting an accurate look at a culture during our brief encounters, but nonetheless we can't help but form opinions as we explore the country. In Scotland, it seemed especially easy to collect other people's opinions about the Scot's. The first to comment were an English cycling couple that among other things commented that the Scot's had to forcibly be made to eat vegetables as they tended to stick to their traditional heavy, fatty diet which both lacked variety and anything green. Their opinion came to mind the first night I did our produce shopping in a small Highlands village market: it took no time at all as there was little from which to choose. The fresh selection was limited to onions and a handful of overripe apples and the frozen section was entirely devoid of produce. In desperation, I finally grabbed a can of corn and a jar of pickled beets as substitutes for broccoli, spinach, or cauliflower. Later we learned that the Scottish youth had surpassed American kids on the obesity scale and it wasn't hard to imagine how they had gotten there. The American couple living in Edinburgh had commented on the Scottish attachment to the way things were done in the past. They found this especially amusing within his US hi tech firm which has a relatively short history in Edinburgh, as the employees were resistant to change, even though the 'way it's always been done' wasn't all that long. They were also taken aback at how quick some Scots had been to confirm that a guest within a social group was English and then begin ostracizing her because of her heritage. And they had clearly had their fill of the Scots reminding them of American blunders in history. The American couple's experience with Scottish xenophobia prompted me to ask our first English B&B hosts in the Highlands if they had any anti-English experiences. Their stories as newcomers in their village 4 years ago clearly indicated they were received with open arms and yet they had guests who said they hated the English. When queried, the guests commented that this couple was excluded from their hatred but that the general hatred against the English stood. They weren't quite sure which bit of history had earned them this hatred, though had no trouble coming up with several possible events as the source. Another English couple who owned a B&B in Scotland also commented on how they were welcomed as "incomers" by their Scottish neighbors. Both couples felt strongly that the Scot's were tolerant of them as city people, especially English city people, because they were intent on fitting in rather than changing the way things were done in the community. The new fangled ideas and ways of city folk are repelled by the Scottish country people along with the people promoting them. of our fellow Scots will turn collaborator. Beware of the brood of traitors in ours midst. No doubt this position represents the platform of an extremist group, but this published position is out there. Even though the English B&B hosts felt well received by their Scottish neighbors, many of the Scots earned low marks on our "generosity to strangers" indicator, especially compared with their English neighbors. They weren't awful mind you, but we just kept noticing their shortcomings. One B&B hostess stood in the door while we still straddled our bikes and complained about us arriving too early (even though the room was ready), being too wet (nothing compared to the previous 6 days), and some other comment about being Americans that I didn't catch and chose not to pursue. Several of the Scottish B&B hosts assured Bill on the phone that they had a secure place for our bikes at night, but when we arrived we were told to leave the bikes against the house in the rain. We reminded them of their promise for something better and were finally led us to the shed or garage. Several Scottish hosts made vague comments that left us feeling that we hadn't done things quite right with our arrival, which just hadn't come up in other countries. Interestingly, for the first few weeks in the Highlands, the warmest and friendliest Scottish B&B hosts were English transplants. They were notably outgoing and welcoming and made us feel like they were glad to have us as guests. "Contrariness" was the word that kept coming to mind as we interacted with some of our Scottish hosts. One host consistently deflected and diverted the simplest of our comments and questions--there was no straight answer to be gotten from him. I noticed when other guests arrived he pointed out to them things he neglected to tell us, like where the community kitchen was located and where to find him if we had a problem. It made me wonder if keeping the traditions of hatred of the English alive was also fueling a general defensive insularity in some of the Scots. In contrast to the many cool to offending hosts, one Scottish B&B host about our age countered the emerging stereotype by being utterly delightful. He was originally from the Isle of Skye and had worked for 10 years in Uganda after completing his agriculture degree. He had done home exchange vacations in the US and in Germany with his family and traveled quite a lot. He commented as to how the dislike of the English and Germans he was taught as a child had vanished with his adult experiences and about his disgust the with ongoing hatred of the English that was sanctioned by the Scottish government. He also was critical of some of the promotion of past battles with the English as a means of fostering Scottish pride--something that we also felt was unnecessarily divisive. And he pointed to the unity among the American athletes at the recent Olympics, at how they could all stand together and be happy and proud together, something that he felt was impossible on "Team Great Britain" because of the nationalistic tensions. This host's comments about the promotion of past battles were fascinating, as we frequently heard references to a battle between the Scots and the English in 1746. Given the ease with which the Battle of Culloden found its way into conversation, you'd think they were talking about something current like the war in Iraq. I think that generally in the US the hatred of the enemy in a given war substantially dies out with the generation that fought the war. We certainly don't whip up hatred of the British and give our thanks to the French when we celebrate our independence on the 4th of July. But amazingly, the bygone Battle of Culloden repeatedly slipped into one-time conversations with strangers, which seemed like it was hindering the ability of many Scots to live in the modern world. We are spending a couple of days in Glasgow, Scotland for some sightseeing and to catch-up on our chores. We've had 1 day without rain since we left Inverness and they still manage to whip up some gusty winds for us now and then. Once again we've demonstrated that we can't travel south as quickly as the cool temperatures settle in. But we still have our eye on Spain and hope to have some mild winter weather there, though it will probably be another month before we leave Britain.